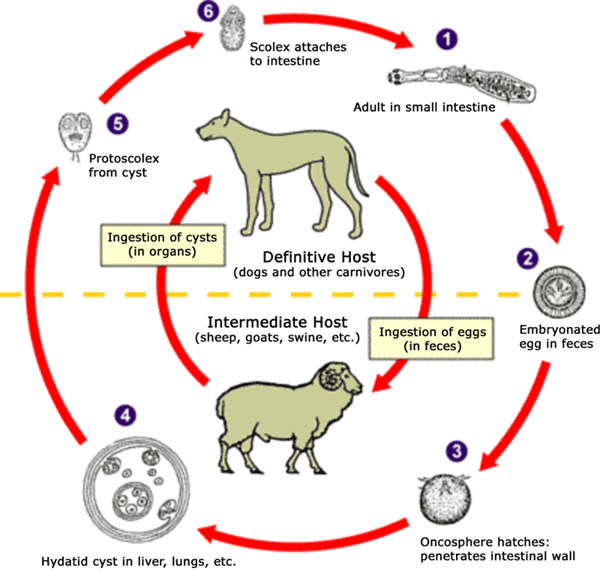 The normal life cycle of Echinococcus species does not involve humans. Human disease occurs when humans become an accidental intermediate host for the parasite, and tissue invasion is followed by the formation of cysts (hydatid cysts). The definitive hosts for echinococcal species are canines (usually dogs), in whom the adult worms live. There may be several hundred worms within a host, and the worms are small, usually 3-6 mm long. The scolex is attached to the dog intestine, and to each scolex is attached a single proglottid. As the proglottids mature and become gravid proglottids containing several eggs, they detach and are passed in the stool. The eggs are resistant to desiccation and may remain viable for weeks. Eggs are ingested by intermediate hosts, commonly sheep and cattle but occasionally humans. The eggs hatch in the duodenum, and the larval forms penetrate the intestinal mucosa and disseminate through the blood stream to distant sites, most commonly the liver. Within tissues, the larva develops an encasing cyst composed of an outer layer and an inner fluid-filled layer. Within 1 year, cysts may reach 5-10 cm in diameter. Inside the inner layer, daughter cysts form which may detach and float within the fluid, and daughter scolices may form. Ingestion of meat containing hydatid cysts leads to infection of definitive hosts, and adult worms develop. Infections with Echinococcus granulosus cause the formation of unilocular cysts. In contrast, infections with Echinococcus multilocularis are associated with multilocular cysts. E multilocularis also differs from E granulosus in that definitive hosts include foxes, wolves, cats, and dogs, and intermediate hosts include small rodents. Endemic areas for E granulosus include Africa, the Middle East, southern Europe, Latin America, and the southwestern United States. For E multilocularis, forested areas of Europe, Asia, and North America are endemic. In humans, the presentation of infection depends on where the hydatid cyst forms. The principle locations for cysts in humans include liver (60%), lung (20%), muscle (4%), kidney (4%), spleen (3%), soft tissues (3%), brain (3%), bone (2%), and other (1%). Within the liver, cysts may be incidentally diagnosed or may present as pain or a visible mass. Pulmonary cysts are usually asymptomatic, but if sufficiently large, may cause cough, dyspnea, or pleuritic pain. Although rare, hydatid cysts in the brain are potentially the most serious and may cause obstructive hydrocephalus with ataxia and dementia or mass effect with seizures, headache, or focal neurologic deficits. Bony hydatid cysts most commonly involve vertebrae and present with bone pain. Other presentations include soft tissue swelling and bone pain or pathologic fractures secondary to cysts weakening cortical bone. In = 20% of infected patients, cysts will be multiple, so a thorough evaluation is required of all patients in whom the diagnosis is suspected. Eosinophilia may be present in = 25% of patients, but it is a nonspecific marker. Serologic testing is available, by a variety of techniques, and, if positive, the results provide supportive evidence of echinococcal infection. However, a negative result of serologic testing does not rule out hydatid cyst disease. More recent serologic techniques may help to differentiate E granulosus infection from E multilocularis infection. Cross-reaction between cysticercosis and hydatid cyst disease has been noted with some serologic assays. Another potential diagnostic procedure is cyst aspiration, although it poses some risk for anaphylaxis (see complications). This test is potentially useful to diagnose E granulosus hydatid cysts. A small volume of fluid is removed and examined microscopically for the presence of hydatid sand (daughter cysts and scolices). If a cyst is old, sand may not be present, in which case a centrifuged specimen should be examined for the presence of hooks. Radiographically, cysts appear as either unilocular cysts with an air fluid level (E granulosus) or as multiloculated cysts with little or no fluid (E multilocularis). Since the usual presentation of hydatid cysts is either liver pain or mass, lung mass with irritative symptoms of obstruction, or seizures with focal neurologic symptoms, the primary differential diagnosis is to rule out primary or metastatic malignancy of each of these organs. In a unilocular hydatid cyst, the radiographic appearance is often sufficient to exclude malignancy. In contrast, multilocular cysts caused by E multilocularis are slow growing, often with little or no fluid, and frequently have central necrosis, all suggestive of malignancy. Therefore biopsy and histologic examination are necessary for definite differentiation from malignancy. On occasion, hydatid cysts may leak fluid into the systemic circulation of the host, causing sensitization of the host. Subsequent fluid leaks may then be responsible for the induction of an allergic response or even anaphylaxis. In addition, release of cyst tissue may be associated with embolization and the development of additional cysts at distant alternate sites. Cysts also may become secondarily infected, producing abscesses. Mechanical complications of the cyst are also possible, most commonly leading to portal hypertension, ascites, and portosystemic shunting. Therapy for hydatid cysts caused by infection with E granulosus combines surgical and pharmacological interventions (see Box 2). Solitary unilocular cysts at operable sites are generally treated with surgical excision, percutaneous drainage, or both. Extreme care must be taken to avoid spillage of cyst contents and subsequent seeding of other sites. One approach has been to remove a portion of the cyst fluid and instill a cystocidal agent such as 95% ethanol before removing the entire cyst. Some authorities also recommend pre- and postoperative therapy with either albendazole or mebendazole. Recent experience with albendazole is a promising alternative. Mebendazole is an alternate therapy but may be less effective that albendazole. Complicated or multiloculated cysts (caused by E multilocularis) require surgery, often in association with albendazole as above. An experimental approach to inoperable cysts involves oral therapy with albendazole or mebendazole, combined with percutaneous aspiration and instillation of 95% ethanol. Although promising, this approach has not been validated in large trials. The prognosis of hydatid disease is variable. With early diagnosis and treatment of simple unilocular cysts, the outlook is excellent; in contrast, advanced multilocular disease at multiple sites with advanced portal hypertension is a potentially lethal condition. Medical therapy of inoperable E granulosus cysts is associated with cure in 30% of cases and improvement in 50%. Inoperable E multilocularis is associated with a 10-year mortality rate in 90% of cases. In such cases, indefinite treatment with albendazole or mebendazole is recommended by some authorities. In areas endemic for hydatid disease, the disease is commonly transmitted incidentally during activities such as camping and picking berries. Education is the best prevention for transmission in these settings (Box 3). Routine screening of household pets and appropriate treatment of animals found to carry Echinococcus spp. is another important control measure. Pet owners should be educated as to techniques of good hygiene to prevent accidental inoculation of eggs from dog stools. Lastly, carcasses of infected hosts must be disposed of in ways that prevent transmission to canines.